When we started Team for Life, we had certain hopes and aspirations as to what it would become. We’re proud to say that Team Bang It Out for Julio! is the embodiment of our greatest dreams! When Julio Llerenas was diagnosed with leukemia, he didn’t just fade into the darkness. Like the leaders we all strive to be, Julio took matters into his own hands and chose to fight. This battle was not to be fought alone though. Julio’s friends were ready to support him every step of the way with whatever he needed. It just so happens that Julio’s life partner is none other than Lazarex’s CAO, Maribel Montanez. Together with the help of Julio’s best friend, Hector Lopez, Team Bang It Out for Julio! was registered as a Team for Life fundraising team in his honor. Following Julio’s lead, the team of 12 signed up for the 2016 Reebok Ragnar Napa Valley Relay to raise funds for Lazarex. Not your typical run, this relay covered over 200 miles from the San Francisco ocean side start near Golden Gate Park to the finish in Napa Valley. Team members ran day and night to complete the 35 legs of the race. It surely wasn’t easy as multiple team members went down with minor injuries. However, Team Bang It Out for Julio! has strength in numbers, as there was always another team member ready to step up. View the team below standing proudly with their medals. 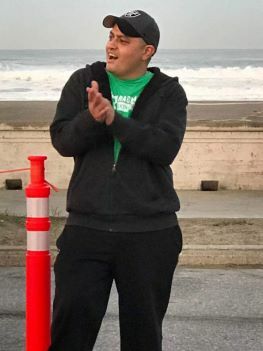 Still in treatment but responding well, Julio showed his support to Ragnar Napa Valley by volunteering at the start line and the finish lines. He cheered on the Lazarex Cancer Foundation teams and all the other crazy Ragnarians! 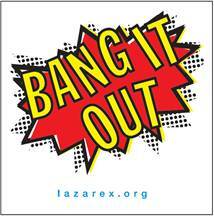 Anyone who’d like to join Team Bang It Out or form a team for the 2017 Ragnar Relay should contact Maribel@lazarex.org. Many thanks to Team Bang It Out for Julio!, Team Be About It, Bjorn to Run, Brief Stents as Runners, and She Irons/Get Outta My Van. The $80,000 raised by these Lazarex Ragnar teams will be used in 2017 to help 237 cancer patients travel to the breakthrough cancer treatments they’ll receive through FDA clinical trials! Read Julio’s sincere story below sprinkled with his signature infectious optimism! “When I was diagnosed with leukemia many rallied behind me, strangers and friends alike. My friends were shocked by the news and wanted to help out in any way possible. While in the hospital I knew that I was going to be fine because of their overwhelming support and the treatment that was established by many before me. Many friends wanted to support me monetarily but I couldn’t accept their gracious donations because of my strong headedness. My girlfriend Maribel, who is my angel, and my best friend Hector Lopez, established a way for everyone to contribute. My friend Hector had his Team Bang it Out for the Ragnar Relay race established prior to my diagnosis. This team was built to raise money for the Lazarex Cancer Foundation. Without hesitation the team agreed to change to Team Bang It Out for Julio. The outpouring of love from the many friends, strangers and companies that donated (and matched contributions) contributed about $40,000 to patients in clinical trials. We raised so much not just because of me, but because of our story that we told people. Our story was about how I got to be in one of the greatest cancer treatment centers in the nation, and, how my treatment protocol was set by people who lived and died before me who participated in clinical trials. The knowledge, support and love on that hospital floor only gave me more strength to fight. Without the sacrifice of other cancer patients to try new treatments and procedures, my life would not be sustainable. For that I’m forever grateful.